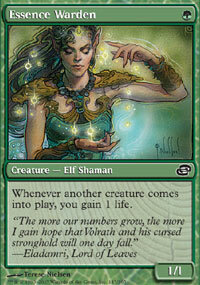 Ravnica Allegiance resides comfortably in our clients, and it's a set that contributes to a few minor tribes. I'm finishing up the evaluation, which will be out next week, but in the meantime, let's give a mention to a couple of these new additions that changed the face of a whole tribe. So, Sheep! Such a glorious tribe! The first one is an artifact, the second one is an enchantment, the third one is neither. They share neither a color nor a mechanic. The first one wants Equipment on the opposite side, the second one wants "life matters" cards, the third one wants Gates. They all are uncommon, though, so there's that. They're also all male, in opposition, for instance, to Horse, which is a female majority tribe (one stallion for ten mares, which might be true to life in horse breeding). 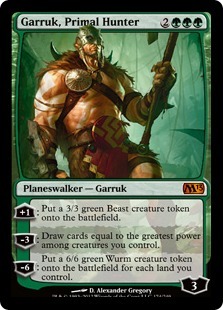 How often does Ooze get two mythics in the same set? 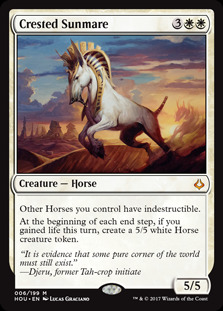 Or at all, since there was only The Mimeoplasm before. And these are two of the three most expensive cards in the set right now (the third one is Hydroid Krasis , of which we talk about below). And one of them looks like a pretty Elf and works like Birthing Pod . 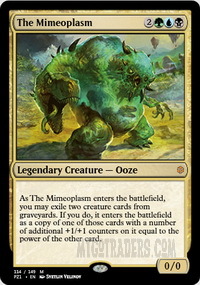 Ooze took over the Simic Combine, as it should. Second event of the year, brand new winner, appropriately. Congratulations to ThyShuffler and his Vampires, the same ones that couldn't get him into the semifinals in the Invitational (nice revenge here!) 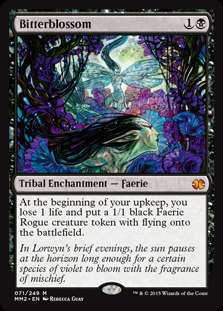 They're also the ninth different tribe winning Modern back to back, a series that's going on since late 2017. 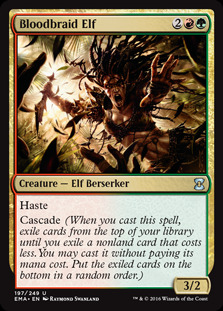 We've had Human, Spirit, Elf, Zombie, Goblin, Beast, Rat, Eldrazi, and now Vampire (okay, I'm cheating, there was a second Goblin in there, but it's still an impressive variety, even if they're all tier-1 tribes). 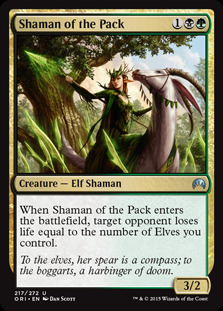 Elf got close to its second Modern win thanks to DiamondDust and this purely aggro list, with Bloodbraid Elf as the curve-topper, no Ezuri or other ramp payoffs, just Shaman of the Pack as a finishing blow. I also did well (first of the losers!) with these Golgari Shamans where Essence Warden keeps Bitterblossom at bay and Grave Pact interacts with most of the other Shamans. I scored against Ultimate Champion Bandit Keith's Goblins, and veteran AJ_Impy's Knights featuring seven creatures protected from my spot removals, and I'm very proud of that. Too bad I misplayed badly in game three against DiamondDust's Elves. Nagarjuna ranked fourth with his Horses, built around Crested Sunmare , something you can do effectively in-tribe too, thanks to Diamond Mare and (Shield Mare). 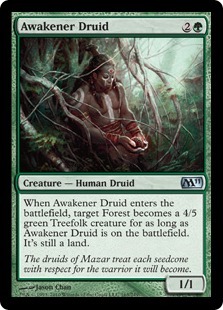 Finally, this Druid deck by sheaj31 deserves a mention just because it takes the Druid route rather than the more obvious Elf route, and it performed very well even with 8 Overrun effects and only 20 creatures; Howl of the Night Pack helps with that, and Awakener Druid surprisingly finds a function. I'm also very partial to Mul Daya Channelers , which is one of those powerful creatures that never qualify as powerful enough to warrant a slot for themselves. Here's Generalissimo's new (troubled) adventures in Spirits, a list that gave him two first places in the past. Key words here being "in the past". 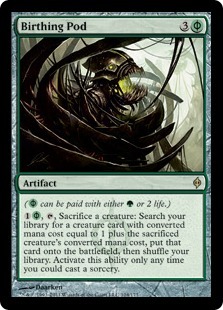 KUMAGORO: So, gentlemen, Hydroid Krasis , budget considerations apart (the thing sells for 32 tix right now! 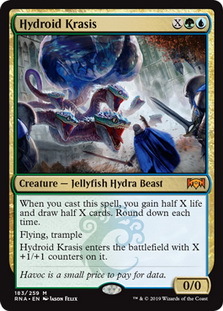 ), is it worth splashing blue in Hydra Ramp for it? 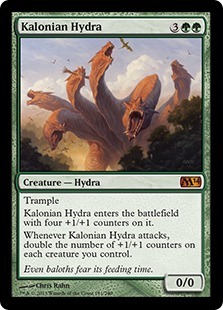 PROS: It gives you life, not much, but some; it gives you cards, which no other Hydra we've been running does; it flies. 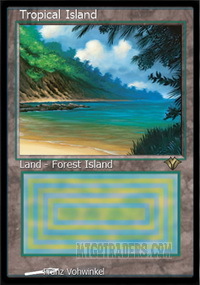 CONS: It requires the deck to run at least a set of Tropical Island and some fetches, which weakens the deck a little against Wasteland , might occasionally force to dangerously put the Auras on a nonbasic. NAGARJUNA: I don’t like it. For 6 mana you get a 4/4 flier, 2 life and 2 cards. For 10 mana you get a 8/8 flier, 4 life and 4 cards. 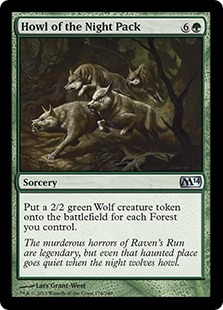 I would stick with the more efficient trampling Hydras and dedicated card draw (Harmonize , Hunter's Insight or Garruk, Primal Hunter ), if you need it. 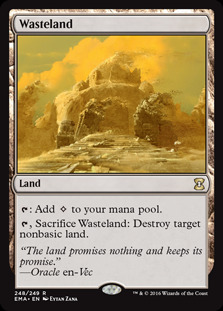 KUMAGORO: I'm not too keen on the idea of including it either, but here's a counterpoint: 6 mana, 4 power in the air and 2 cards is the same deal you get from Consecrated Sphinx on the first turn, and with Hydroid you get the card draw even if they kill it immediately, and even if they counter it, because it's a casting trigger like the Eldrazi have. And 4 cards while you cast a 10-mana Hydra is huge, they have to deal with a massive flier that will kill them pretty soon otherwise, and you're likely to have drawn into another big threat in hand to replace it. It's bad in early turns (casting it for three and wait for Kalonian Hydra to grow it later might feel underwhelming), but a ramp deck shouldn't worry too much about running pure payoffs, if these payoffs are worthy. GENERALISSIMO: Hydroid definitely seems worth a try. 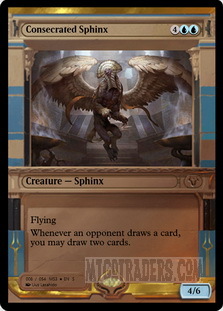 Honestly, the lifegain and card draw just feel like bonuses to me: the fact that it has flying and trample are the things I'd be most excited about. KUMAGORO: Yeah, that lifegain is entirely incidental. 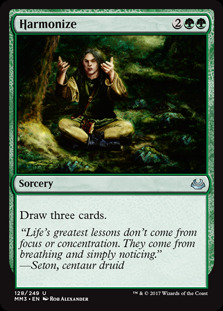 I think they shouldn't have rounded down the life, one life is nowhere near the same value as one card. In fact, two life isn't either.